Feminine and whimsical, the Whisper floral hair pins are enchanting and full of exquisite details. The flowers in various stages of bloom were inspired by the beauty of wildflowers and the carefree styling of freshly picked flowers woven into loose hair. 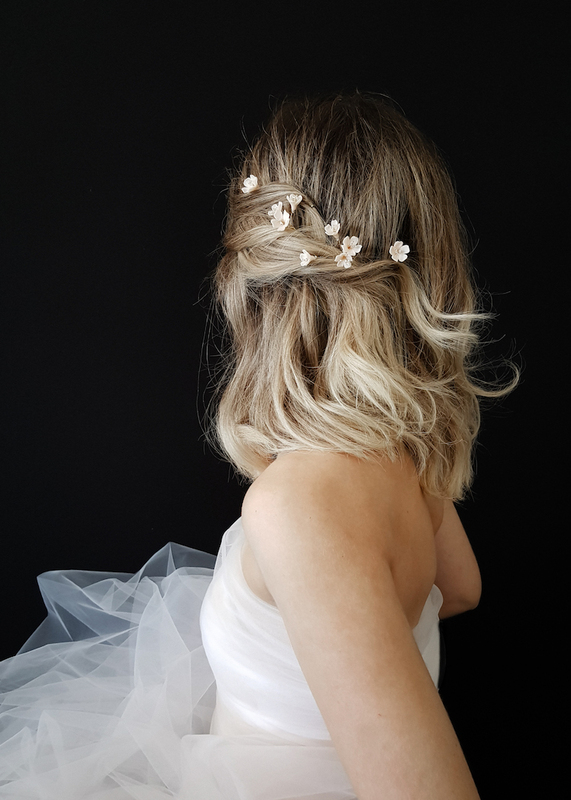 These precious handcrafted flowers are available in blush, ivory, ombre (ivory and blush combined), white or champagne tones and are perfect to scatter across a romantic updo or half up hairstyle. Designed for the bride seeking something dramatic and non-traditional, Whisper makes a beautiful statement without the formality. Featuring handcrafted clay flowers, Czech seed beads. Set of 5 hair pins. Attached to 5 metal hair pins. Colours: Flowers are available in ivory, white, champagne, ombre or blush tones. Silver or gold wiring. The Whisper floral hair pins are ready to ship. Please allow 5-7 business days for processing plus delivery times. The Whisper hair pins are designed for the bride craving a touch of relaxed luxury on her wedding day. Whisper pairs perfectly with structured and unstructured gowns of rich feminine appeal, and contrasts beautifully against cleaner and modern silhouettes. The Whisper pins can be styled in a row to create a floral cluster at the top of a bridal updo. For a whimsical look, scatter them to the side of a romantic chignon or to the side of a side swept hairstyle. They can even be styled with other headpieces for a more organic vibe – think the Apple Blossom, Jasmine or Le Poeme styles. Whisper can be worn with a veil – we recommend a drop veil with minimal or no gathers at the comb for a more seamless finish. Heavy gathers at the top of a veil can take away from the delicate nature of this feminine set. Browse our full veil collection or contact us and we’d be happy to offer a recommendation to suit the Whisper based on your wedding dress and hairstyle. The hairpieces can be reworked into smaller or larger sets to better suit your bridal hairstyle. Details can be reworked into a new design – for example, a larger comb or hair vine.